Green remodeling, or remodeling with sustainability and energy efficiency in mind, is a popular remodeling trend that many homeowners are incorporating into their next remodeling projects. 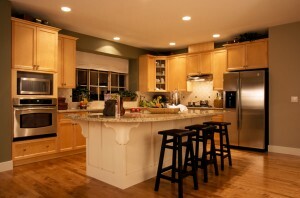 One project in which green remodeling can really thrive is kitchen remodeling. With all of the components and appliances that go into a new kitchen, it’s easy to find opportunities to focus on energy efficiency and eco-friendly materials. If you’re interested in making your next kitchen a green one, check out these tips for green kitchen remodeling! From the top to the bottom, green components can make up many of the big components of a kitchen remodel. For sustainable kitchen cabinets, look for wood certified by the Forest Stewardship Council. This means that the wood used to make these cabinets has been obtained via sustainable forest management. They also use fewer volatile organic compounds than other kinds of cabinets, which means fewer toxic fumes. Sustainable materials can also be found in green kitchen countertops. Several brands use an assortment of recycled materials, including recycled glass, wood, bamboo, and other materials to make countertops. Looking for green flooring? Cork is a popular choice. Because this material is used from tree bark which grows back, it’s an entirely sustainable flooring material. It’s also moisture-resistant, slip-resistant, and comfortable to walk on, three necessities for the kitchen. Linoleum is another popular sustainable flooring option. Another great area in which to go green is kitchen appliances. Anything with an Energy Star label has been certified as energy efficient. Look for these on dishwashers, microwaves, and refrigerators to improve your energy savings. According to House Logic, “Energy Star models are 25% more energy efficient than the federal standards for energy consumption.” When looking at refrigerators, remember that those with the freezer on top can use up to 25% less energy than those with a side-by-side fridge and freezer. This entry was posted on Friday, September 5th, 2014	at 9:04 pm	. You can follow any responses to this entry through the RSS 2.0	feed. Both comments and pings are currently closed.